Muammar Kaddafi is a dictator. That has been a banal fact of life since the 1980s. What is more interesting is that this predecessor of Saddam as embodiment of pure evil in the minds of many westerners is now welcome in France. Actually he, along with his millions in oil revenues, has received the best of French red carpet hospitality. After years of being ostracised from the international community for ’ irresponsible’ behaviour Muammar is now back in fashion. If there was one example of collusion between the interests of what has been called the Military-Industrial complex and the foreign policy of a government, that would be it. To be fair, during the photo opportunities Nicolas Sarkozy looked slightly uncomfortable and many of his ministers appeared lost for words while others in his own party and the opposition made their views clear on the visitor’s record on human rights. 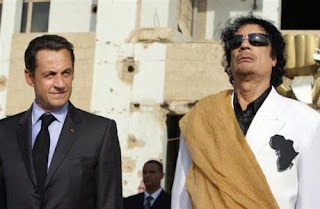 Mr Sarkozy did ‘ask’ his Libyan friend to ‘do better’ on democracy (A statement later denied by Kaddafi on French TV) but despite her brave stand, Rama Yade, French secretary for human rights, was unfortunately wrong. France can be treated as a doormat when its economy is doing badly and foreign investments can translate into jobs for French workers. Airbus and Dassault might be the direct beneficiary but faced with the prospect of long term economical benefits the French Left is unlikely to challenge the Realpolitik adopted by their opponent for fear of upsetting the working class and the business world alike. On a positive note this rapprochement between Paris and Tripoli could facilitate Mr Bernard Khouchner’s mission in Lebanon by endearing France again to the Syrian regimes. If Kaddafi can still turn up at the Elysee with his head high despite looking like an ageing rocker (Anyone noticed the resemblance to Johnny Holiday!) then surely the brilliant ophthalmologist from Damascus would shine with his elegant wife at his side. I love the dictator when he behaves like one. Look at Kaddafi body language in the picture, excellent. The same goes for the recent actions of the Venezuela dictator Chaves, his recent moves and anger breaking everything in his room is revealing his inner soul as a dictator. But I hate more the dictators who give smile and use kids and teach them how to clap for him while imprisoning their parents. Thos kinds are more dangerous. You are correct.It is striking that Kaddafi doesnt try to hide his true image. But despite this the French and soon the Americans will be ready to bend backwards for him. U dont even need to pretend to be civilised these days... flash the cash and you will be served. This is a message to us all, the dictator are not the west's problem it is our problem. Hope the people will get this message in the decade.